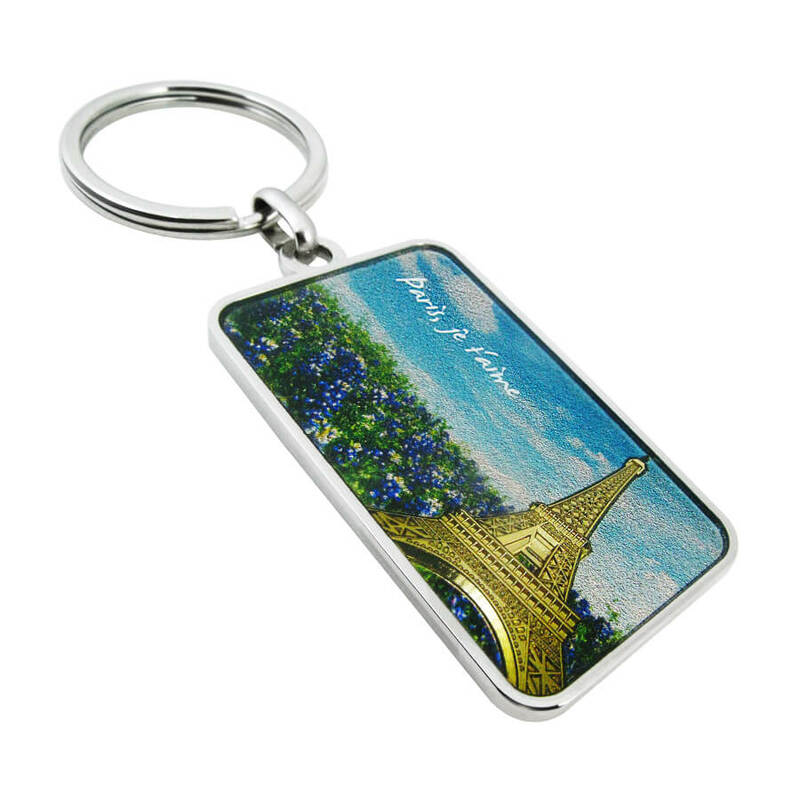 Vivid Embossed Eiffel Tower Keychain - Chung Jen International Co.,Ltd. 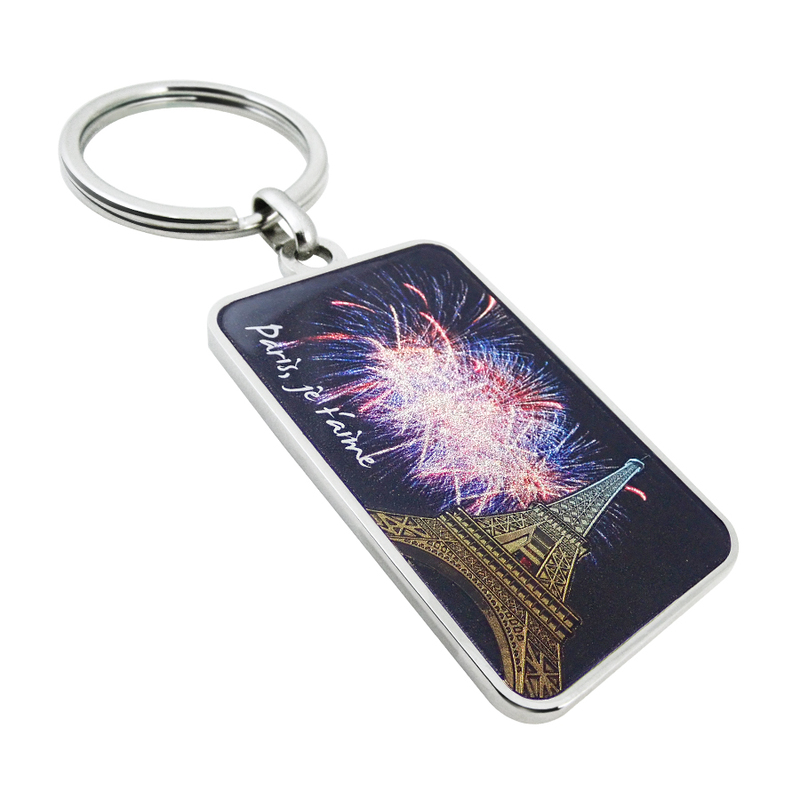 Embossed Eiffel Tower Keychain: The metal keychain takes the splendid Eiffel Tower as the hero to serve as a great gift or souvenir. 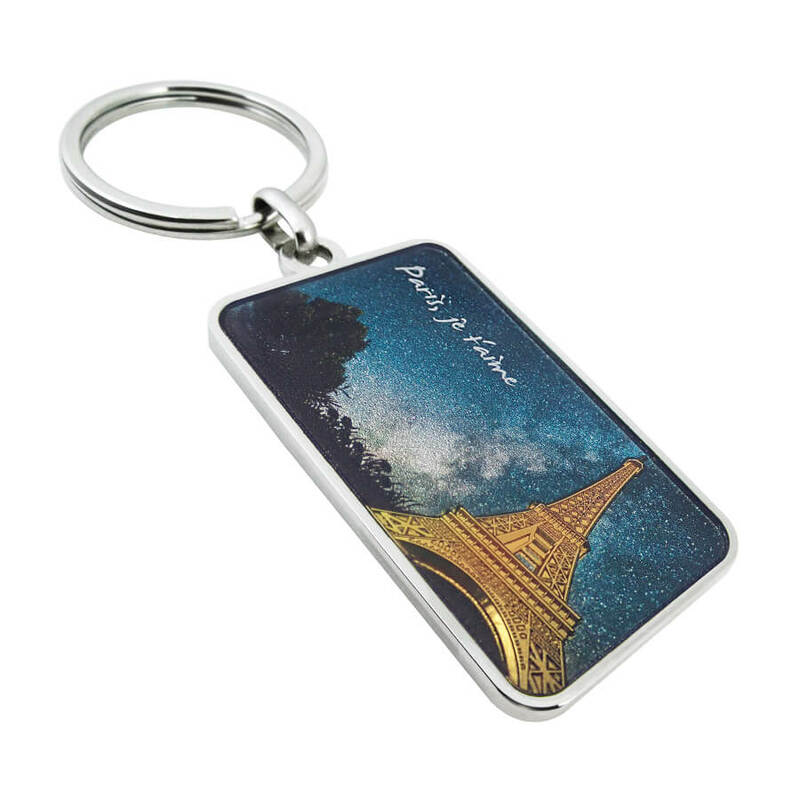 With advanced skills and printing techniques, the embossed Eiffel Tower on the right corner stands out from the background to catch people’s eye. 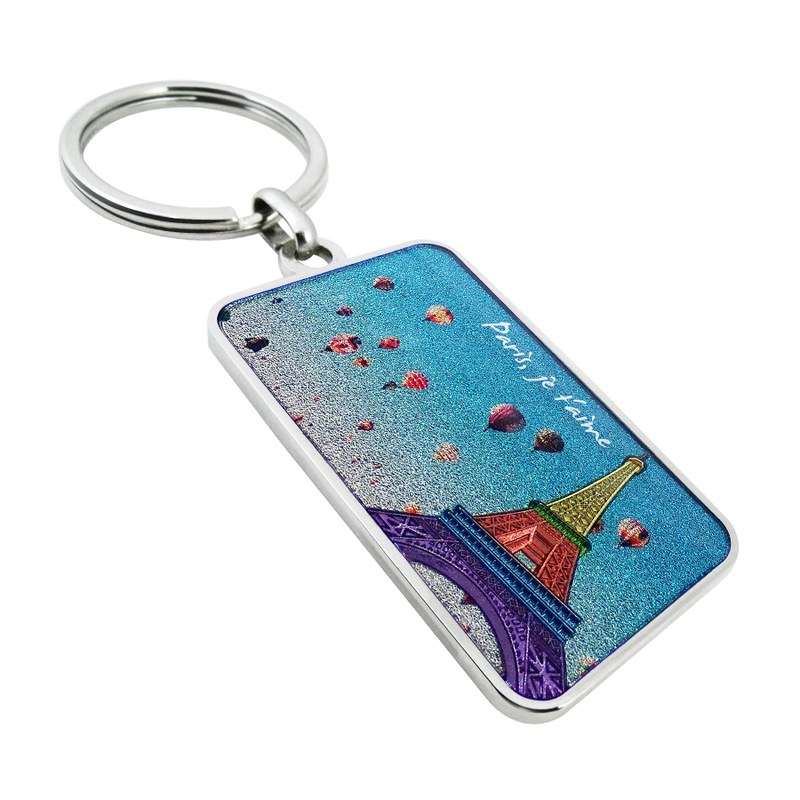 The Eiffel Tower along with the left area is open for customized design. 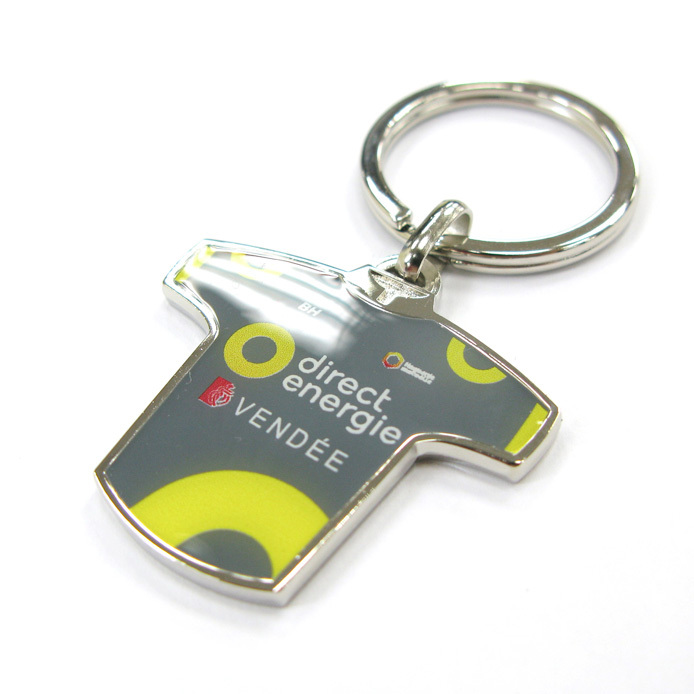 Digital printing can be used to produce the plating texture with much more flexibility on color choices. 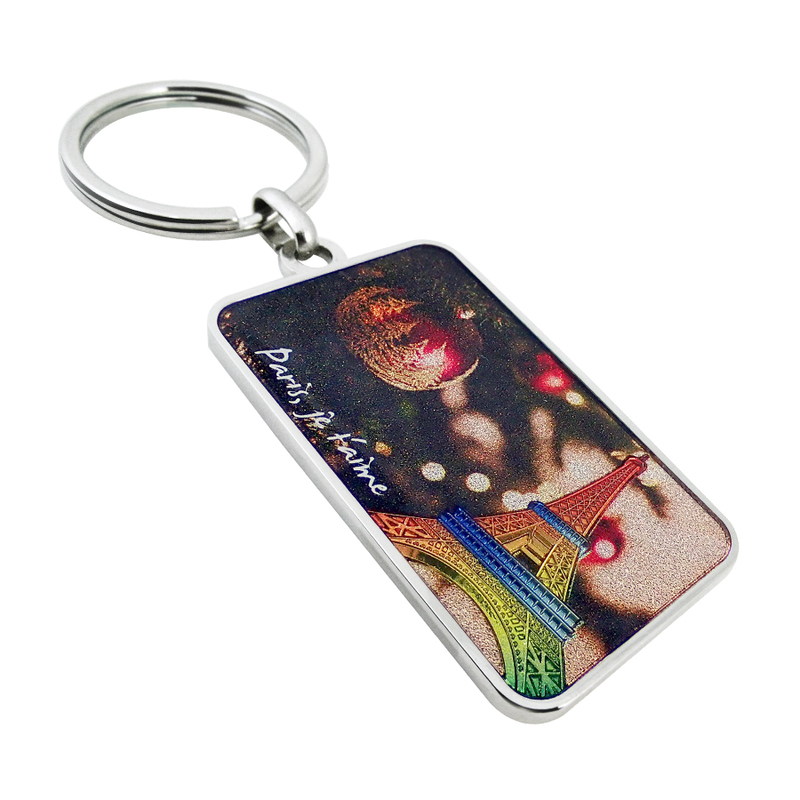 A layer of transparent epoxy will cover the printing as a protector to make the keychain more durable. 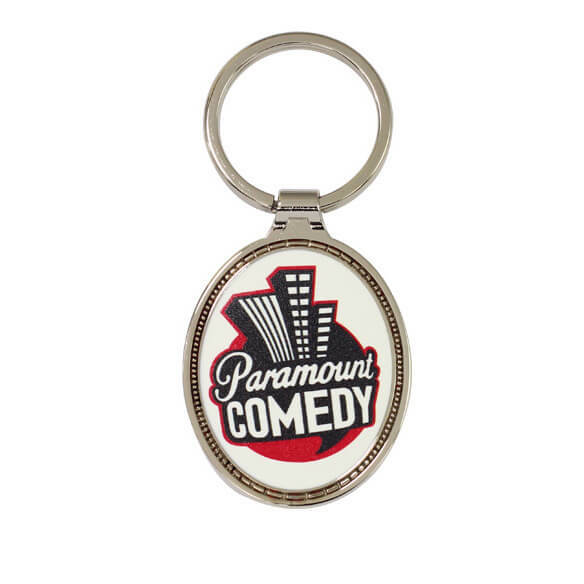 The flat, smooth back of the keychain can be printed or laser-engraved with custom logos or icons to maximize the design probability. Precision molds, professional die-casting technology, careful polishing, the best electroplating process, produce high-quality products for you. From the design to the mass production process, there are many practical problems to be overcome. Our R&D team can effectively make recommendations to modify and realize your products. We are a high-quality factory to supply international orders. Without the margin of importers and trading companies, you can get a favorable price under a large qty purchase. Sample, production, repeat order have consistent quality. We are responsible for supplying goods, and always remember your requests. From the design, production, QC, packing to delivery, meeting all your needs once. Multi-delivery ways on land, sea and air. We have shipping agent in Hong Kong providing on time shipment service allows you to cooperate with us without worries. Our plating or grinding/polishing equipment complies with local government regulations. We have certifications regarding environmental protection. With years of business experience, good communication and insight into the needs of customers, we plan your next step in advance and provide complete service. Is your company a manufacturer or a trader? We are Taiwan company and have our own factory in Fujian, China, mainly producing zinc alloy products for more than 30 years. You can have high-quality goods and the best factory direct purchase price without the margin of importers or traders. Any certification on factory and products? Our factory is BSCI certified and Disney ILS Social Compliance Audited, and got China government permit of sewage disposal. Our products and the materials also comply with related regulations. Our annual structural ODM products also got patent certificates. What is the minimum purchase quantity (MOQ)? 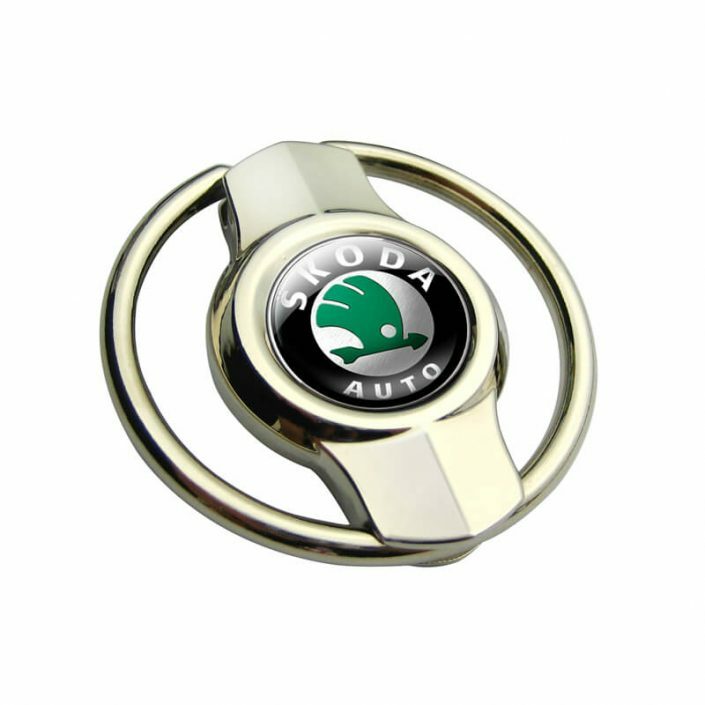 OEM customized products: Considering the mold and development costs, we suggest to order at least 500 pcs to obtain preferential prices. ODM standard models: The MOQ is 300, effectively reduces the cost of purchase and achieves your greatest benefits. How long is the lead time from order to delivery? After artwork approval, it takes about a week for sample and 3-4 weeks for production, plus the shipping time, then you can receive the goods. If it’s complex designed product or the purchase quantity is large, the production time needs to be re-confirmed. Please feel free to contact us if any query. We recommend you choose the standard models to shorten the mold and proofing time and meet your urgent needs. How to pay for a deal? For the first order, the customer will be required to pay the full amount in advance by T/T or PayPal for small amount under US$300. Please contact us for details. What are the options for shipping? You can choose to ship from Hong Kong or Xiamen by air, sea or courier door to door service to get your goods faster and grab the initiative. 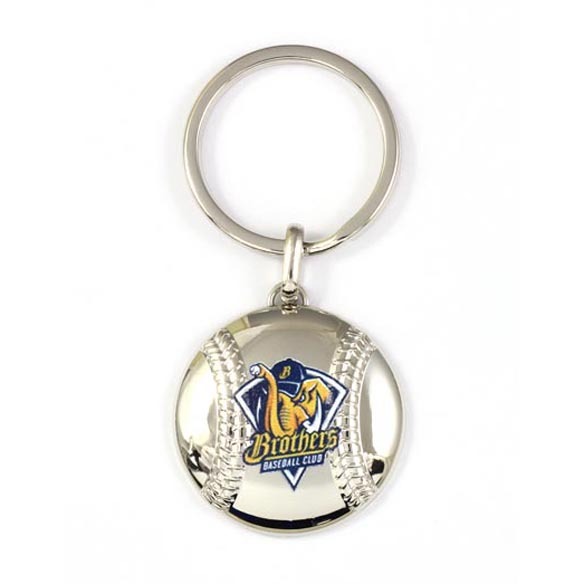 Chung Jen International Co., Ltd. established in 1987, is a professional manufacturer of zinc alloy products, mainly produces zinc alloy keychains. We have professional R&D department to develop various of good quality gifts & premiums according to customers’ needs. 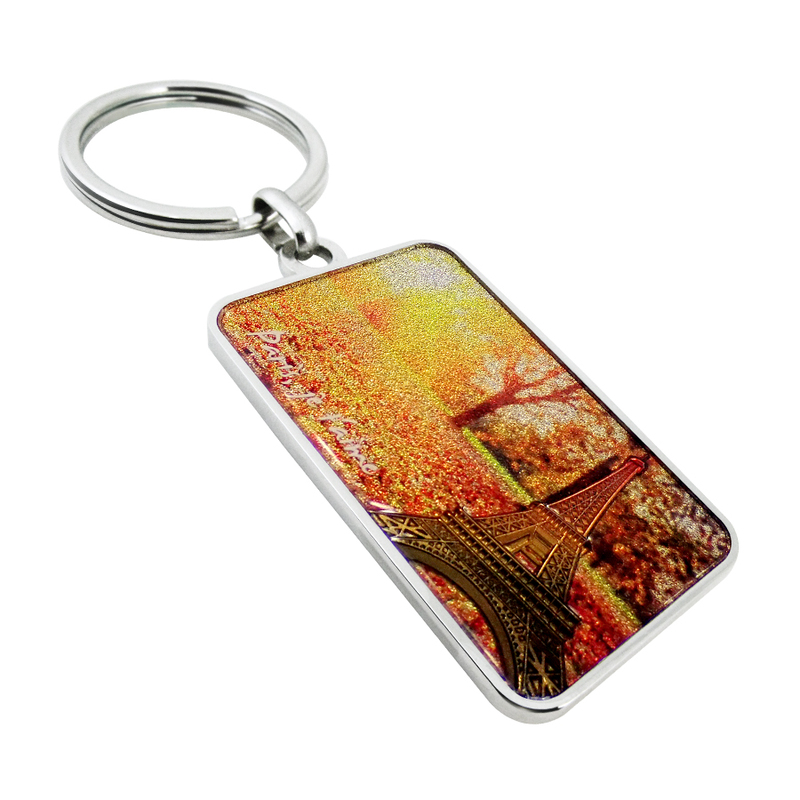 Chung Jen continuously launches ODM items like keychains, coin keyrings, badges, emblems, medals, medallions, golf accessories, belt buckles, cufflinks, tie bars, mobile ring stands, cable winders, photo frames, paperweights, USB flash drives, bracelets, etc. 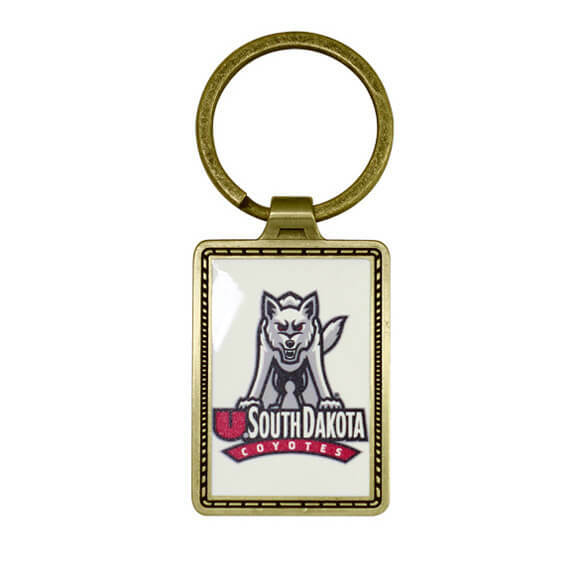 We have decades of experience in making zinc alloy souvenirs / promotional items and offering high quality service. We are definitely the best supplier you can trust! Chung Jen keeps improving our manufacturing technology and extending our product range to household hardware, boutique accessories, 3C peripherals and other zinc alloy products. We pursue high quality of the product and realize every detail. Chung Jen looks forward to working with you! Leave us your message. We will communicate with you as soon as possible. Thank you. * Please complete all the fields marked with asterisks (*).